Let's kick off week 2 of my Star Wars ABC's with the letter "I." I is for "I know." This is one of the most powerful lines in all the Star Wars, ranking up there with "I am your father" in terms of impact. It was such a Han Solo Thing to say; such a definitive Han Solo Moment. The line was pitch-perfect in every way. Except it almost never came to pass. The story is legendary. George Lucas had originally scripted Han to say, "I love you, too" after Leia professed her love for him. 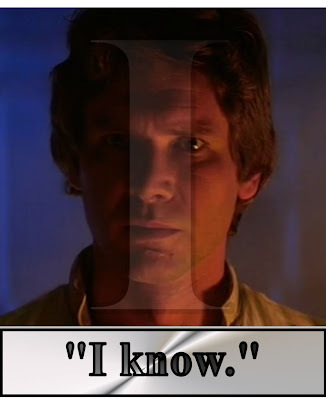 Harrison Ford felt the line was out of character; that a rogue like Han Solo would not simply blubber "I love you, too." He and Lucas haggled about it. When it came time to shoot the scene, Empire director Irvin Kershner told Ford to improvise. Thus, "I know" became a part of Star Wars lore. Can you imagine it any other way? TOMORROW: He doesn't doesn't just hang smugglers; he hangs them on his wall!